Deliver: Agile Webinar Replay on Dynamic Reteaming, March 2018. Dynamic Reteaming on Infoq podcastMarch 2018. LeanPub podcast about my career & my book October 2017. Dynamic Reteaming on the Passionate teams podcast Nov 2017. 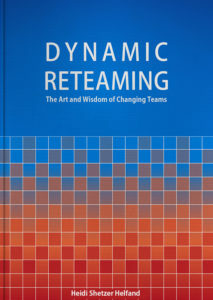 Dynamic Reteaming on the Agile Uprising podcast. Dynamic Reteaming Podcast on GrokShare with Dr. Dave Cornelius. Nurturing Relationships as a way to manage the system – In this podcast I talk about having retrospectives beyond the team level, specifically getting groups of people with common goals together for reflecting, such as mentors, new hires, people that interview, etc. Helping Teams Gain their Independence – the scrummaster’s job is to help the teams be “self-running.” We help get them up to speed and then fade out so that we can help other teams. I talk about that in this episode and also our goal of developing small things to solve customer problems – really a Lean UX approach to development. The Us vs Them Antipattern – When a team member is struggling and they are in a different role, we need to band together to help them succeed. Relationship building is imperative in software development. If you know and care about the people you work with, everything else is easier.